In this ancient devotional service, we walk with Christ through that last hours of his life, reflecting on his sufferings, death, and burial through reading the Bible, music, and prayer. Children are welcome to attend. We will gather at Hill Elementary (724 Pennsylvania Ave., Aurora), beginning in the gym, and then moving outside for this outdoor service. Preview the service order here. Following the stations service at 2pm, there will be opportunity for healing prayer or confession with a pastor. The earliest followers of Jesus recounted the story of his passion, death, and resurrection. When the emperor Constantine made Christianity legal in AD 313, pilgrims flocked to the Holy Land to visit the homeland of Jesus. In particular they wanted to see Jerusalem and visit the places that were part of Holy Week. Egeria, a woman from Gaul who traveled to the Holy Land in the fourth century, recalls in her diary how she joined Christians from all parts of the Roman world on Holy Thursday in their walk westward from the Garden of Gethsemane to the church of the Holy Sepulcher, where they celebrated Jesus’ death and resurrection. Over the years, the route of pilgrim processions—beginning at the ruins of the Fortress Antonia and ending at the church of the Holy Sepulcher—was accepted as the way that Jesus went to his death. It came to be known as the “Sorrowful Way” (Via Dolorosa in Latin). The pilgrims marked the last moments of Jesus’ life on Good Friday by prayerfully stopping at all the sites associated with Jesus’ suffering and death. When they returned home, these pilgrims shared with others the powerful experience of walking the way of the cross in Jerusalem. The Stations of the Cross, as we know them today, came about in the twelfth century, when it was no longer easy or even possible to visit the holy sites, now under Muslim rule. Saint Francis and his followers encouraged Christians all over Europe to walk the way of the cross with Jesus by creating in their own villages “replicas” of the Via Dolorosa. 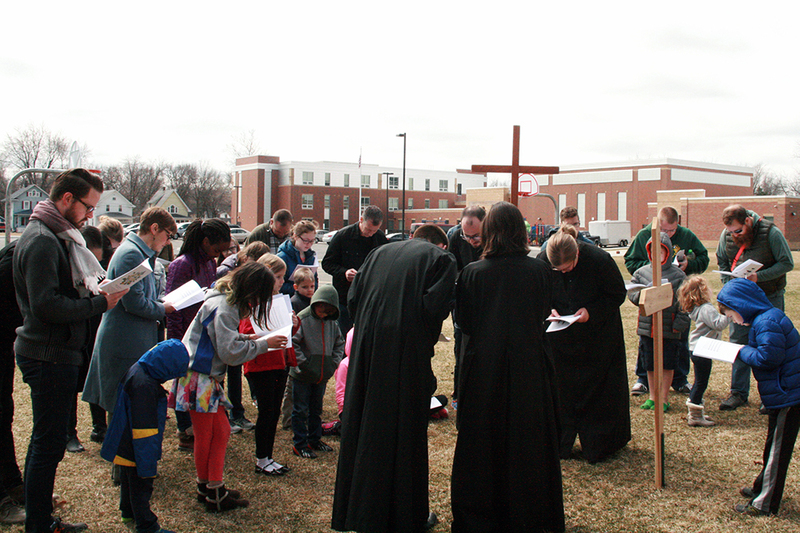 These early Stations of the Cross had anywhere from five to thirty small places of worship along an outdoor path; eventually, they became the standard set of 14 stations that we know today.